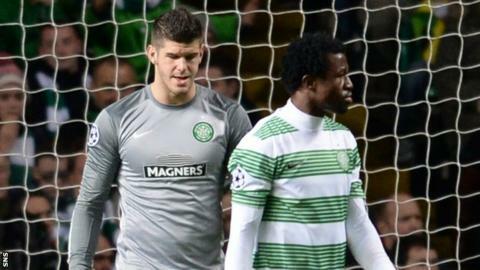 Fraser Forster is already planning for next season's Champions League following Celtic's European exit. The England goalkeeper was beaten three times by AC Milan in Glasgow in a defeat that means Celtic are guaranteed to finish bottom of Group H.
"The league is always the most important thing," Forster told BBC Scotland. "If we get it right in the league, we'll get another crack at the Champions League next year." Kaka was allowed a free header from a corner early in the first half while Cristian Zapata tapped in from another set-piece shortly after the break. Mario Balotelli then wrapped up a comfortable victory with a third goal on the hour as Forster was left exposed by his defence. "We were playing against a top quality team with top quality individuals," explained Forster. "Those moments of quality that they had just took the game away from us. "We were a bit unlucky. We had chances but it just wasn't meant to be." A group that also contained Barcelona and Ajax was always going to be a tough proposition for fourth seeds Celtic and the club will finish on their lowest-ever points tally unless they win on match day six at the Nou Camp on 11 December. "We've done well to get this far," was Forster's assessment. "We've loved every minute of being in the Champions League. That's where you want to play and the lads can be really proud of what we've done. "We've got one more game against Barcelona that we can go and enjoy." Mikael Lustig was not so upbeat, with the defeat coming soon after Sweden's World Cup hopes were dashed in a play-off with Portugal. "It's been a bad week," said the Celtic right-back. "I had a big dream to play in the World Cup and now that's over. I know what it's like to play in the last 16 (of the Champions League) and now that is over. "Right now we are really disappointed. Every player want to play in the Champions League or the Europa League. "We need to go home and maybe be a little bit sad but then we need to focus on Sunday (a Scottish Cup visit to Hearts)." Reflecting on the defeat in which Celtic had double the shots on goal AC Milan managed, Lusting said: "It felt like when we faced Juventus last year. "We were well in the game, we had most of the ball and created chances. "We haven't conceded a goal from a corner in almost two years and we do it twice tonight. "Of course when they scored we had to go forward but I don't think Milan created so many chances. "To win games we need to be good in our box and be good in their box as well - and weren't that today. "We played decent but if you want to win games at this level you need something extra and we haven't had it in this campaign. "If you compare it to last year, I think we maybe created more chances this time but we have not been good enough to score them."